Ask fellow campers about "Frank Russell COE" and nearby attractions. We overnighted here. Typical COE park, it was spacious, and from what little walking we did, it was clean. The COE volunteers were very friendly. We would definitely stay here again. 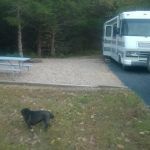 We camped at Frank Russell COE in a Fifth Wheel. The dump station is to the left of the fee booth. If you go through the fee booth first, from what we observed you'll have to drive around the campsite loop to fill your water. However if you fill your water first, the hydrant will be on the wrong side & you'll have to run the hose under the rig. Beautiful COE park about 20 minutes from Hannibal, MO. Stayed for about a week. We were in the "entrance" sites, on your way to the two major loops. Nicely screened from each other, easy to back in. Clean as a new penny. Almost level, needed one board. No water at space, but great electric. Water and dump about .1 mile. Rangers, as always at COE, were nice and friendly. Stopped in the "Project Office" (COE-speak for main office) and talked to several. Visitor's center very nice, lots of info, beautiful building. Several other COE campgrounds just on the other side of the dam. We'll be back for sure. We camped at Frank Russell COE in a Motorhome. There's a little gas station/grocery about three miles up County Road J. Other than that, you're driving to Hannibal -- about 20 minutes. Walmart, Groceries, everything. Visit the boat landing and Mark Twain's birthplace. Nice little winery at the birthplace, open Th/F/S. WONDERFUL IGA grocery in Paris, MO. I have no idea why this campground has never been reviewed. We stayed here for two nights. Its pretty standard COE except there are so many trees it makes maneuvering a little difficult. The roads are newly paved but a little narrow, especially for a big rig. There are a lot of equestrians here and the campground is near Mark Twain Lake. Very peaceful and quiet. We'd stay here again. We camped at Frank Russell COE in a Fifth Wheel. Are you affiliated with Frank Russell COE ?